Description: 2014 4940 1200 Gallon tank, standard pump with dual flow meter, Load Command, 120' boom, Stainless Steel, 15" spacing, Boom Trac, Less Foam marker, Traction Control, HID lighting, Underframe Shields, Radar, No Floation Tires. 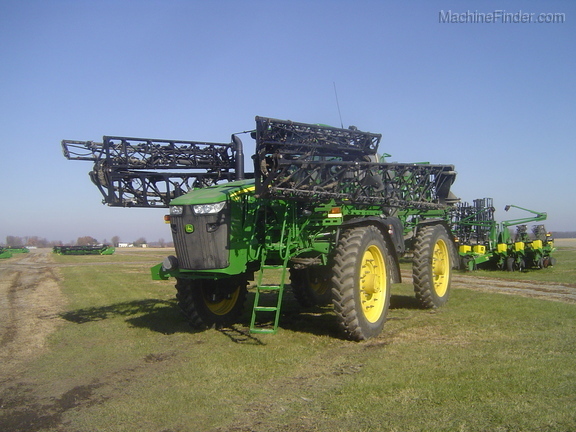 Description: 120' Booms 15" spacing, boomtrac, Foamer, RH Fence Row Nozzle, SS Eductor. 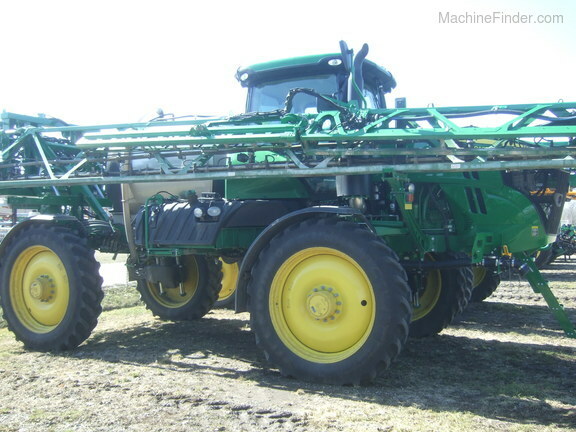 Description: 324 HRS, 380/90R46 TIRES,AUTO SOLUTION, 120' BOOM STEEL 20", AUTO BOOM LEVEL, FOAM MKRS, WHEEL SLIP, BOOM AIR PURGE, LESS RADAR, RH FENCE ROW NOZZLE, PREM ACTIVATION WARR TILL 3-9-19. 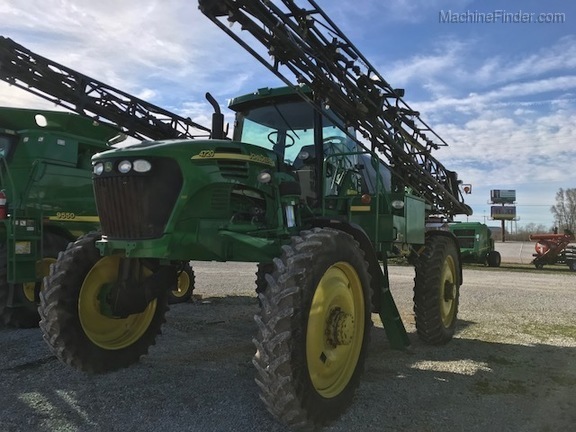 Description: reversing fan, prem cab, stand lights, stereo with blutooth, mech tread adj, all wheel steer, tall crop package, crop dividers, hagie foamer, 380/80R38 tires, GS3, jd rate controller, jd section control, boom auto fold, 90' booms, 15" wet boom, 7 section strainers, manual boom hight, return to height. 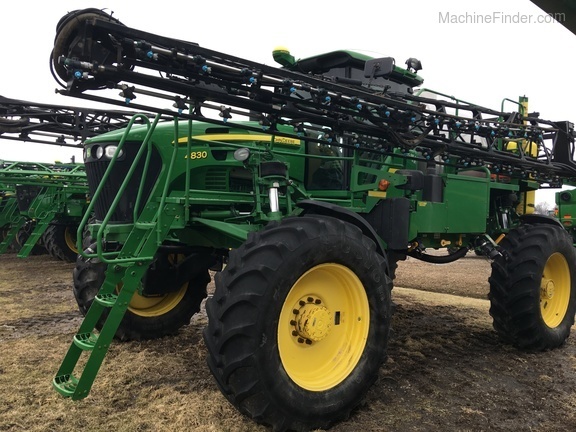 Description: 2015 R4038 100' BOOM ON 15" CENTERS, SS PLUMBING, FOAMER, RH/LH FENCE ROW NOZZLE, RADAR, 380/90R46 FIRESTONES, BOOM TRAC, HI FLOW, FRONT FILL, UNDERFRAME SHIELDS, MANUAL SOLUTION CONTROL, TRACTION CONTROL. DIRECT INJECTION SYSTEM 1 HV PUMP 100 GALLON. 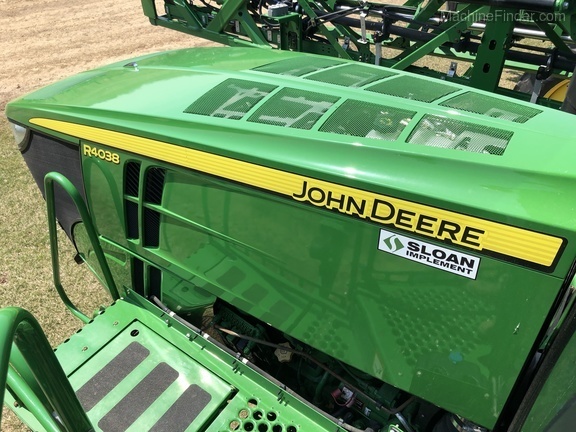 We have several more of this same model in stock at our 20 Deere locations. We trade for equipment every day so call to see what's new and not yet online. We trade nationwide and our own fleet of trucks will deliver directly to your farm. 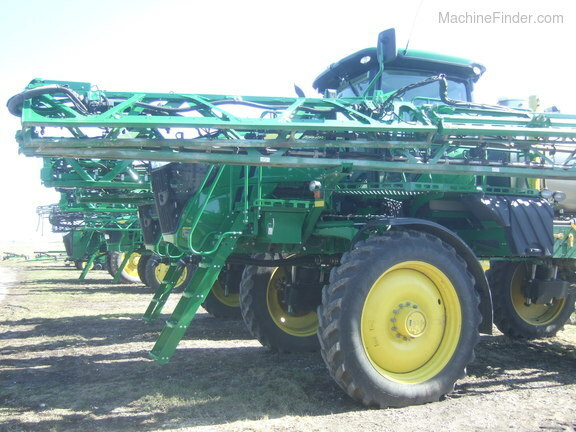 Description: 328 HRS, 380/90R46, AUTO SOLUTION , 120' STEEL BOOM 20", EXACT APPLY, AUTO BOOM LEVEL, MKRS, WHEEL SLIP, AIR PURGE, LESS RADAR, RH FENCE ROW NOZZLE, PREM ACTIVATION, WARR TILL 3-9-19 We have several more of this same model in stock at our 20 Deere locations. We trade for equipment every day so call to see what's new and not yet online. We trade nationwide and our own fleet of trucks will deliver directly to your farm. 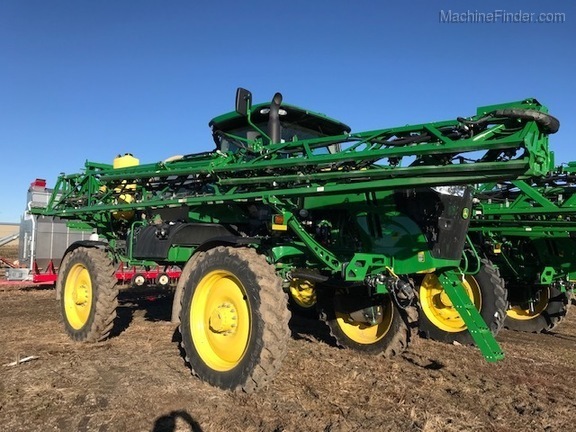 Description: ", PREM CAB, LEATHER SEAT, PREM RADIO, 380/90R46, EDUCTOR, MAN SOLUTION CONTROL, FRONT FILL, 120' BOOM 15"" CENTERS, AUTO BOOM LEVEL, FOAM MARKERS, SLIP CONTROL, RADAR, RH FENCE ROW NOZZLE, UNDERFRAME SHIELDS,EDUCTOR INSTALLED 2018. 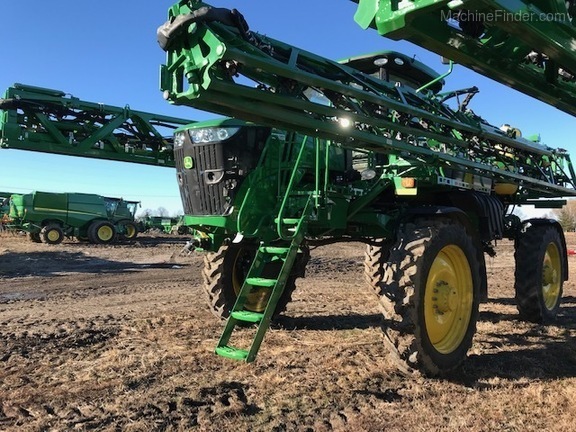 Description: PREM RADIO, PREM CAB LEATHER, 380/90R46 , HI FLOW PUMPS, MANUAL SOLUTION CONTROL, FRONT FILL, 120 ' BOOM 20", EXACT APPLY NOZZLES, FOAM MKR BOOM AIR PURGE, REAR CAMERA, WHEEL SLIP CONTROL PREM ACTIVATIONS, STILL UNDER WARRANTY 3-1-19. 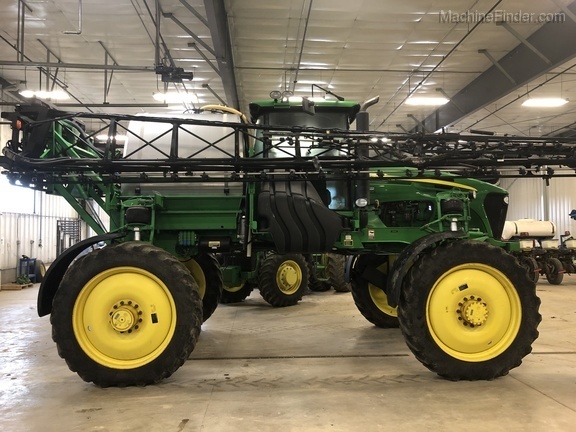 Description: 2018 R4038 SPRAYER, PREM CAB AND RADIO, SF6000 RECEIVER, PREM ACTIVATION, STANDARD PUMP, FRONT FILL, MANUAL SOLUTION CONTROL, 120 FOOT BOOM, AUTO BOOM, 15" SPACING, RH/LH FENCE ROW NOZZLE, LED LIGHTS, SS EDUCTOR, BOOM PURGE, NO FOAMER, WHEEL SLIP, 380/90R46, UNDER FRAME SHIELDS, BEACON LIGHT, RADAR, AUTOTRAC ROWSENSE FEELERS AND HARNESSING. 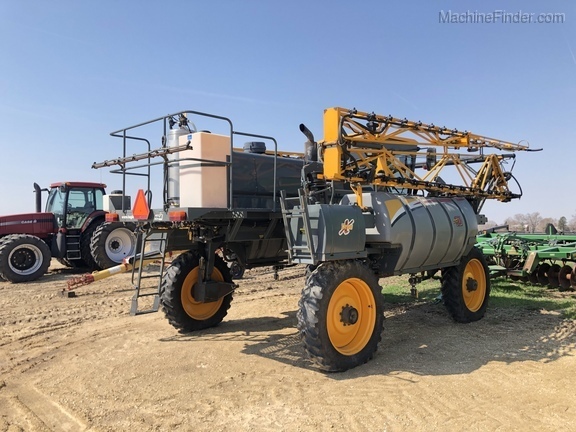 Description: PREM RADIO, PREM CAB LEATHER, 380/90R46, HI FLOW PUMP, MANUAL SOLUTION CONTROL,FRONT FILL, 120' BOOMS 20", EXACT APPLY FOAM MARKER, BOOM AIR PURGE, CAMERA , PREM ACTIVATION WARR TILL 3-1-19. 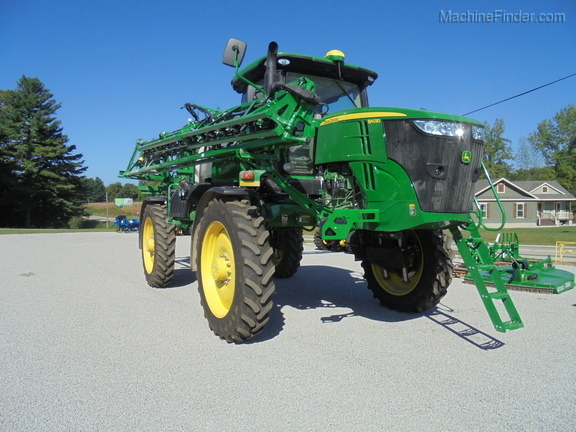 Description: 2008 JOHN DEERE 4830 SELF PROPELLED SPRAYER, 380/90R46 TIRES, ROW CROP FENDERS, 2X1.5 STANDARD PUMP WITH SINGLE METER, LESS EDUCTOR, STAINLESS STEEL 1000 GALLON TANK WITH 3" FILL, 90 FOOT BOOM, 1" POLY PLUMBING, 20" NOZZLE SPACING, HYDRAULIC TREAD ADJUSTMENT, AUTO BOOM TRAC WITH THREE SENSORS, ON BOARD AIR WITH 50 GL MARKER, LESS TRACTION CONTROL, GREEN STAR READY, AUTO AIR SPRING LEVELLING SYSTEM, HALOGEN FIELD LIGHTING PACKAGE, RADIO, RIGHT HAND AND LEFT HAND FENCE ROW NOZZLE, RADAR, WHEEL MOTOR SHIELDS. 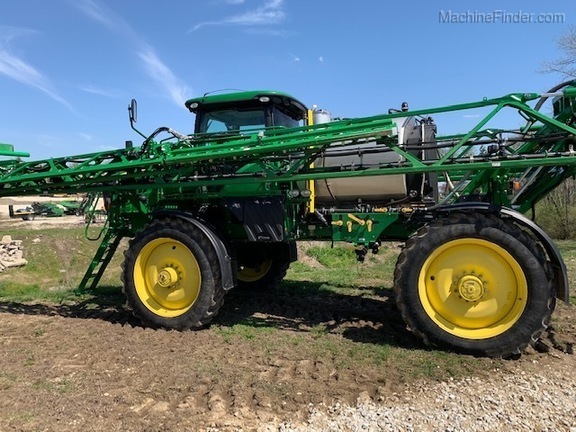 Description: PREM CAB RADIO LEATHER, 380/90R46 TIRES, HI FLOW PUMP MANUAL SOLUTION CONTROL, FRONT FIL 120' BOOME 20" SPACING, EXACT APPLY, FOAM MARKER, BOOM AIR PURGE, REAR CAMERA RH FENCE ROW NOZZLE WHEEL SLIP CONTROL WARR TILL 3-1-19 PREM ACTIVATION. 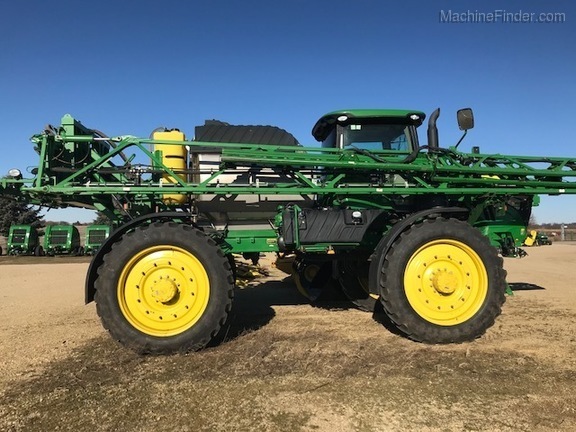 Description: "PREM RADIO, PREM CAB LEATHER,380/90R46 DUALS,HI FLOW PUMPS MANUAL SOLUTION CONTROL, FRONT FILL, 120' BOOMS 20"" , EXACT APPLY NOZZLES,FOAM MKR, BOOM AIR PURGE, REAR CAMERA, DIRECT INJECTION WARR TIL 3-1-19"
Description: 2018 Standard Cab, Starfire 6000, 4600 display w/ AT & Swath Activations, 5Yr JDLINK, Connect Mobile ready, 380/90R46 tires, SS eductor, Manual solution control, Less front fill, 100' steel boom, 15" spacing, auto boom level, foamer, wheel slip, HD lights, Les radar, RH/LH fence row nozzle. 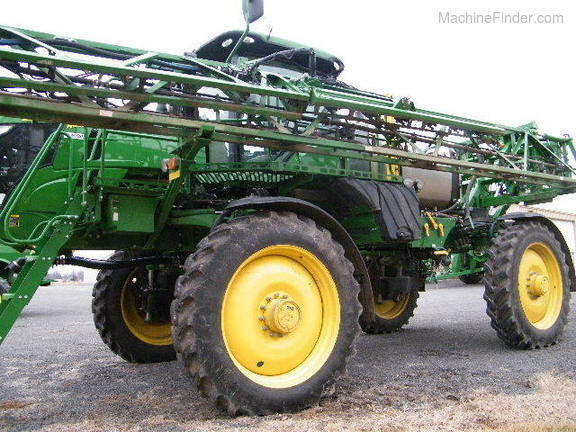 Description: PREM RADIO, PREM CAB LEATHER, 380/90R46, LESS EDUCTOR, MANUAL SOLUTION CONTROL, FRONT FILL, 120' BOOM 20" SPACING, AUTO BOOM LEVEL, WHEEL SLIP CONTROL, RADAR, RH FENCE ROW NOZZLE, UNDERFRAME SHIELDS, RAVEN HAWKEYE SPRAY NOZZLES REQUIRES ADD GS3 OR VIPER 4 TO OPERATE DIRECT INJECTION WILL BE REMOVED. Description: PREM CAB RADIO, LEATHER, 380/90R46, LESS EDUCTOR, AUTO SOLUTION , FRONT FILL, 120' BOOM 20" , AUTO BOOM LEVEL, FOAM MARKERS, WHEEL SLIP CONTROL, RADAR, RH FENCE ROW NOZZLE, UNDERFRAME SHIELDS, DUAL FLOW METER, RAVEN HAWKEYE NOZZLES WARR TILL 3-1018 NEEDS ADDITIONAL GS3 OR VIPER 4 TO WORK. 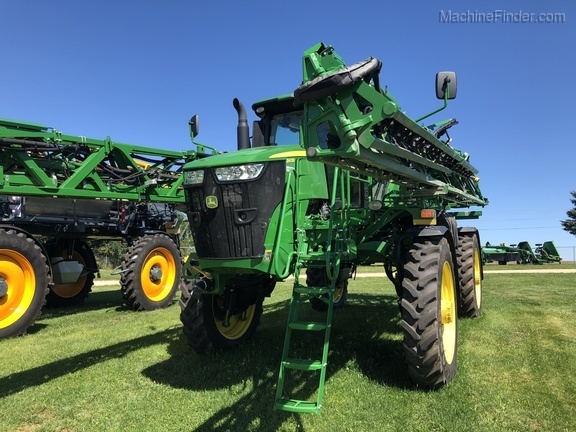 Description: 2009 JD 4830 with 100' booms, 15" centers with 1" SS plumbing, High flow, Boom Trac, Foam Marker, RH/LH Fence Row nozzle, ITC receiver, GS2 display, "NO ACTIVATION" Radar, Belly Shields, rear camera 3" front and side fill CabCam Rear facing camera and display, includes narrow and float tires. 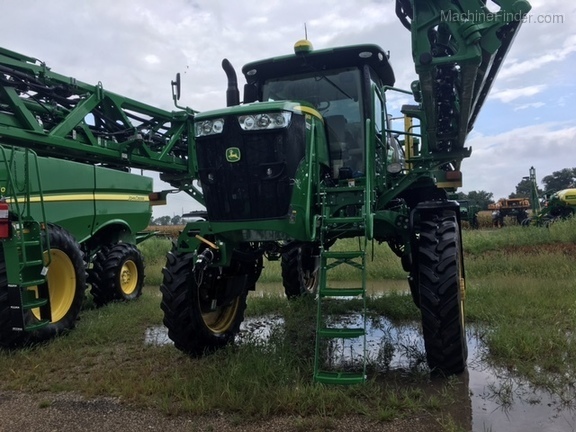 Description: COMMAND VIEW CAB, 2 NEW 380/90R46 FRONT TIRES, LESS EDUCTOR, LESS FRONT FILL, 120' BOOM 20' SPACING, FOAMER, RADAR , RH FENCE ROW NOZZLE. 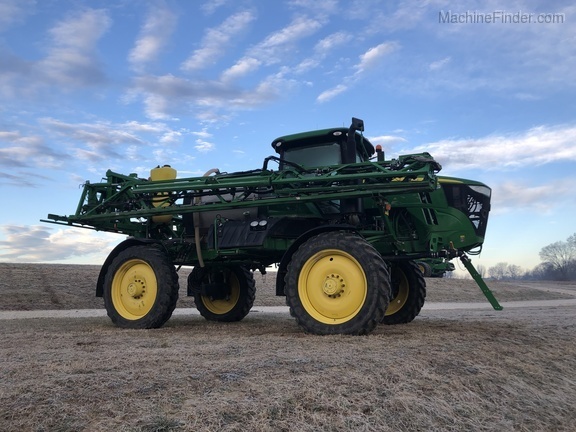 Description: PREM RADIO PREM CAB LEATHER, 380/90R46, LESS EDUCTOR,AUTO SOLUTION, FRONT FILL, 120'BOOM 20", AUTO BOOM LEVEL, FOAM MARKERS, WHEEL SLIP CONTROL, RADAR, RH FENCE ROW NOZZLE, UNDERFRAME SHIELDS, DUAL FLOW METER HAWKEYE SPRAY NOZZLES WARR TILL 3-1-18. 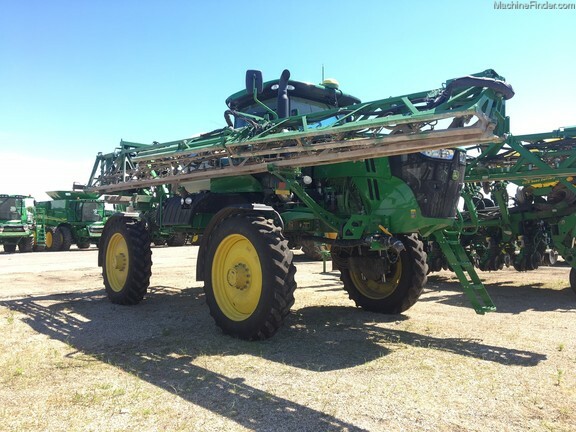 Description: COMMAND VIEW CAB, 90'BOOM WITH 20" SPACING, POLY LINES,, BOOM LEVEL, RADAR,RH FENCE NOZZLE, 380/90R48 TIRES,LESS EDUCTOR AND FRT FILL. Description: COMMAND VIEW CAB,RADIO, 380/90R46 TIRES, SS TANK, 90' BOOM, 20"POLY , AUTO BOOM LEVEL, FOAM MARKERS, RADAR, RH FENCE ROW NOZZLE. 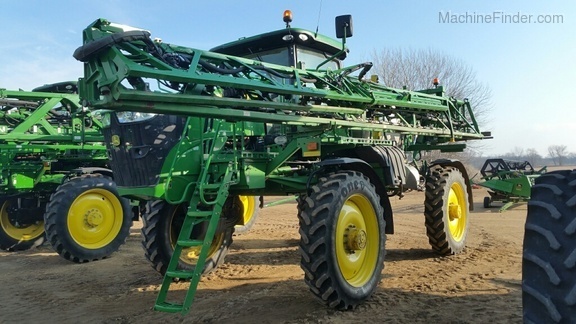 Description: PREM RADIO, CAB, LEATHER, 380/90R46, LESS EDUCTOR, MANUAL SOLUTION , FRONT FILL, 120' BOOM 20" SPACING, AUTO BOOM LEVEL, FOAM MARKERS, WHEEL SLIP CONTROL , RH FENCE ROW NOZZLE,UNDERFRAME SHIELDS RAFAR, DUAL FLOW METER, HAWKEYE SPRAY NOZZLES WARR TILL 3-1-18 HAWKEYE NEEDS ADDITIONAL GS3 OR VIPER 4 TO WORK. 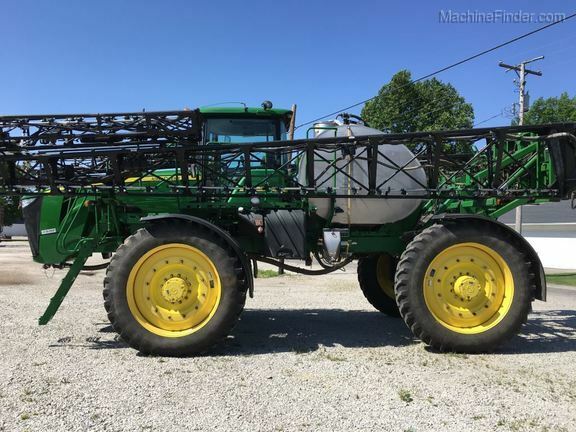 Description: COMMAND VIEW CAB,RADIO, 90' BOOM POLY 20" CENTERS, FOAM MARKER, RADAR, RH FENCE ROW NOZZLE, BOOM LEVEL, 380/90R46 TIRES, LESS EDUCTOR AND FRT FILL. 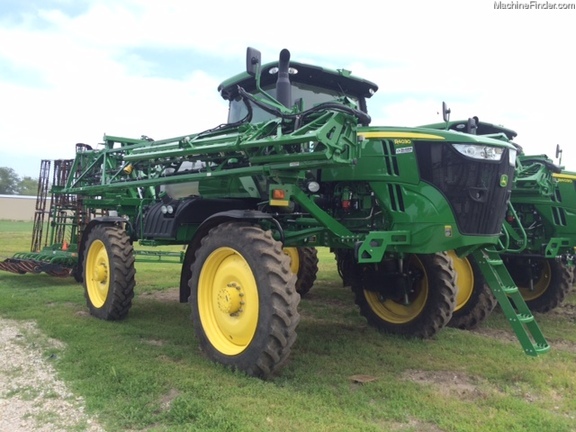 Description: PREM CAB RADIO, LEATHER, 380/90R46 , LESS EDUCTOR, MANUAL SOLUTION CONTROL FRONT FILL, 120' BOOM 20" SPACING, AUTO BOOM LEVEL WHEEL SLIP CONTROL , RADAR, RH FENCE ROW NOZZLE, UNDERFRAME SHIELDS, RAVEN HAWKEYE SPRAY NOZZLES REQUIRES ADD OF GS3 OR VIPER 4 TO OPERATE WARR TILL 3-1-18. 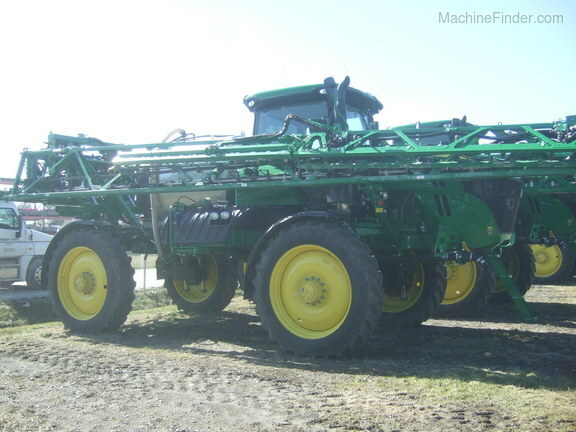 Description: DTS10 90ft boom, 15" centers, 3 way nozzle bodies, fence ro nozzles, foamer, rinse tank, 7 sections, tall corn pkg, has JD rate controler will need 2600 or 2630 to run. 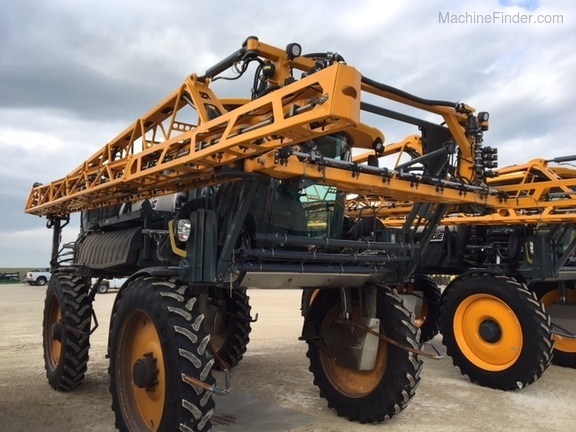 Description: 120',HIGH FLOW,15" CENTERS,STAINLESS PLMBG,LESS EDUCTOR,LESS FRT FILL,MANUAL SOLUTION CTRL,LEFT AND RIGHT FENCEROW NOZZLES,UNDERFRAME SHIELDS,TRACTION CTRL,38/90R46 MICHELIN 60%,2630 WITH AUTO TRAC ACTIVATION AND SECTION CTRl. 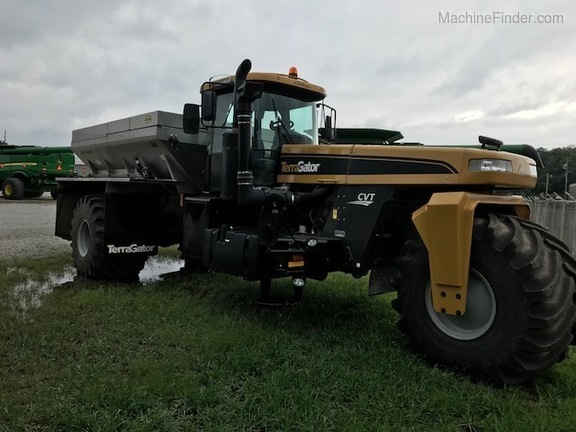 Description: 2017 Hagie D400 Detasseler, 195 HP Cummins 6.7, Backup Camera, Traction Control Drive System, Reversing Fan, Premium STS Style Cab, Std. Lights, Stereo, Hyd. 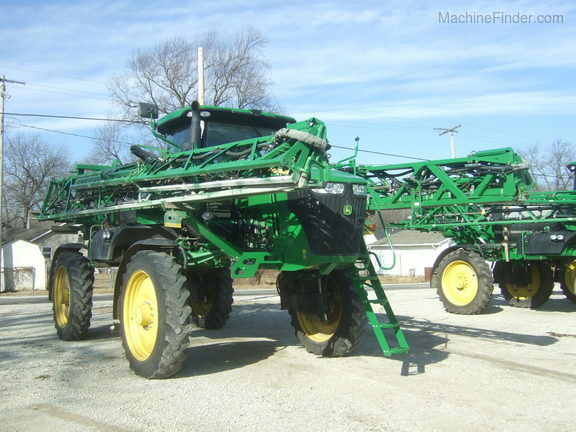 Tread Adjust (118" to 157"), All Wheel Steer, 380/80R38 Goodyear Ultra Spray, Crop Dividers, 12 Row Hyd. Coupler Kit (Cutters to Pullers), 4-2 to 4-1 Hyd. 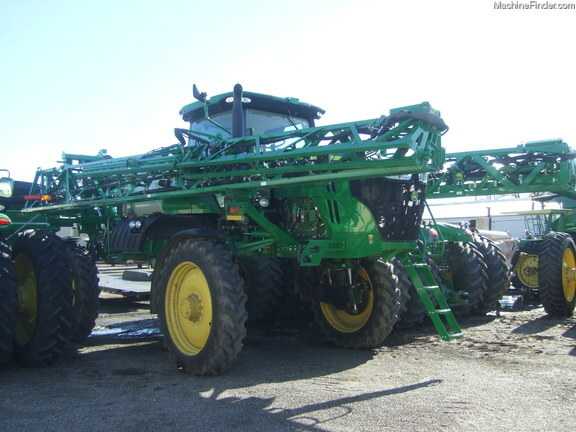 Slide Cutter Attachment (12 Row, 6 Lift), 12 Additional Quad Puller Heads for 12 Row, 6 Lift. 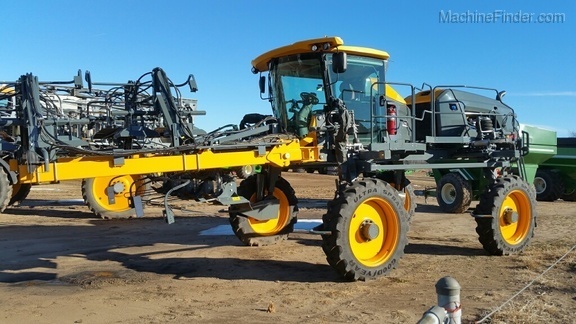 Description: PREM CAB, SS1000, 100' 15" BOOM HI FLOW PUMP, 380/90R46 AUTO BOOM LEVEL, FOAMER, RH FENCE ROW NOZZLE, RH FENCE ROW NOZZLE, FRONT FILL, LEATHER SEAT, AUTO TRAC, SECTION CONTROL AND ROW SENSE. 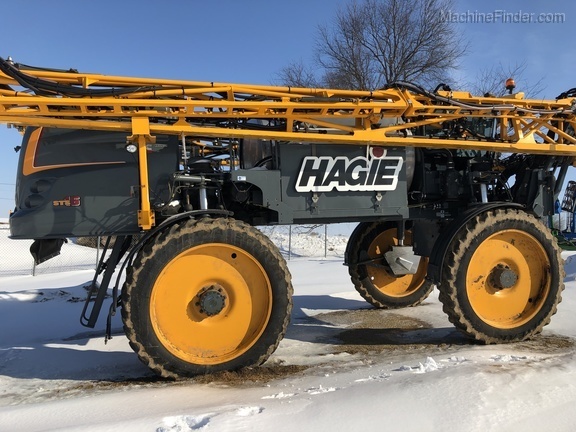 Description: STS 16 HAGIE SPRAYER - 1600 GAL - 120' BOOMS 3 WAY NOZ W FERT HOLE - 15" CENTERS - 5 SENSOR NORAC HEIGHT CONTROL - PREM CAB - JD 2630 W RATE CONTROL AND SECTION CONTROL - 320/105R54 GY IF -AWS - FRONT FILL - HYD TREAD - TALL CROP PACKAGE. 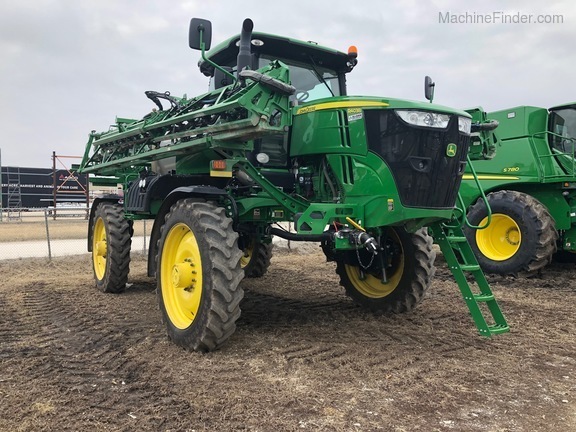 Description: 1000 GAL TANK - 90 ' BOOMS - HYD TREAD ADJUST - BOOM TRAC SENSORS 3 - ON BOARD AIR SYSTEM - AUTO AIR LEVEL SYSTEM - STAINLESS TANK - EDUCTOR - STAINLESS PLUMBING - 15" SPACING - AT READY - RIGHT AND LEFT FENCEROW NOZZLES - TRACTION CONTROL - STANDARD FLOW PUMP - FENDERS - 380/90R46 WILL BE NEW. 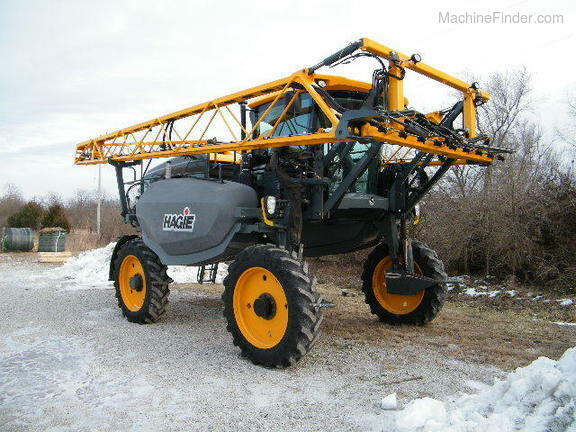 Description: NITROGEN TOOL BAR FOR HAGIE 40' , 15 COULTERS WITH DEPTH BANDS. 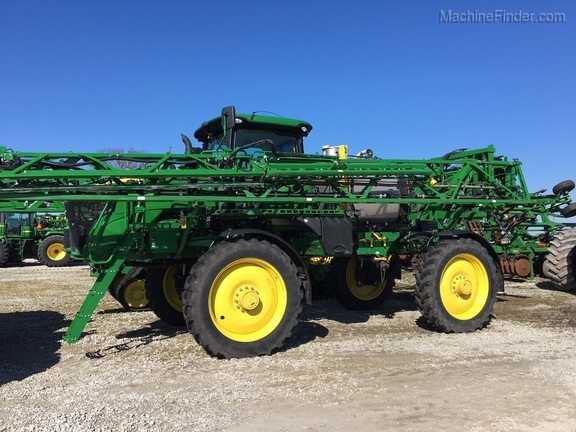 Description: 2005 JD 4720 Sprayer, 800G SS TANK, 90' BOOM - 20" SPACING, RH FENCE ROW NOZZLE, FENDERS, RADAR, FOAM MARKER, HYD TREAD ADJUST, AT VALVE, ITC RECEIVER, 2600 DISPLAY WITH AUTOTRAC ONLY, GOODYEAR 650/65R38 FLOAT TIRES IN GOOD SHAPE, FIRESTONE 380/90R46 @ 75% ON FRONT, MICHELIN 380/90r46 @ 75%+ ON REAR. Description: ATR, CommandView2+ Cab, Prem Radio, 380R46 Firestones, Hi Flo Pump w/Flowmeter, Mnl Soln Cntrl, 120' SS Boom, 15" Spacing, AutoLevel, Foam, Wheel Slip Control, HID Lites, Fence Row Nozzle LH & RH, Beacon.